by Chris Woodford. Last updated: September 19, 2018. There's no warning. None at all. One minute you're happily walking down the street. The next minute the street seems to be walking all by itself! There's a deafening, rumbling, roaring noise. The buildings start to shake. Brick and glass rains down around you. A huge crack appears in the pavement. Fire hydrants burst open. Cars are crushed by falling masonry. People are screaming. It feels like the end of the world. There's not much we can do to stop natural disasters like earthquakes: they're an inevitable part of living on a planet like Earth, seething inside with hidden power. What we can do, however, is monitor changes in the ground beneath our feet so we can predict when earthquakes will happen. We can design our buildings much more cleverly so they absorb the power of sudden shocks. And we can prepare ourselves for the inevitable by planning for the time when (and not if) the next quake will strike. Photo: Our classic idea of what an earthquake looks like. The Earth has literally split apart in this quake, because ground shaking made the fine-grained soil behave like a liquid that drained away, leaving the road above unsupported. This quake, which happened in 1989 at Loma Prieta in San Francisco, California, measured 6.9 on the Richter scale. Photo by S.D. Ellen courtesy of US Geological Survey. You might think Earth is a giant lump of rock, but you'd be wrong—it's more like a freshly boiled egg: there's a hot, molten core bubbling away inside a surprisingly thin outer crust. The countries we live in feel like they're safely anchored on solid rocky foundations, but really they're fixed to enormous rocky slabs called tectonic plates that can slide around on the molten rock beneath. Imagine living your life on an eggshell! Earthquakes happen at places called faults (or fault lines) where the jagged edges of two tectonic plates grind against one another. Most earthquake activity happens in the middles of the oceans where plates are pushing apart on the floor of the sea. Some of the most violent earthquakes happen around the edges of tectonic plates in the Pacific Ocean, forming an intense area of activity known as the Ring of Fire (so-called because there are many active volcanoes there too). 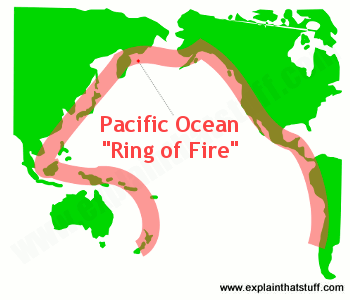 Artwork: The Pacific Ring of Fire (red line): According to the US Geological Survey, about 90 percent of the world's earthquakes happen in this part of the world. Tectonic plates are constantly moving—in incredibly slow motion—and we don't even notice most of the time. But every once in a while two grinding plates will suddenly jolt into a new position. The energy released by this movement creates an earthquake. It starts at a point inside Earth called the focus where the moving plates are in contact, then travels through the ground as very low-frequency sounds called shock waves or seismic waves. The greatest damage happens at a place called the epicenter, which is the point on Earth's surface above the focus. Earthquakes continue until all the energy released at the focus has been safely dissipated. Even then, there's still a chance that further earthquakes, known as aftershocks, will happen for some hours or even days afterward. Seismic waves travel in two very different ways. Some of them, known as primary waves (or p-waves), vibrate the ground in the direction in which the waves themselves are moving. They travel in a similar way to ordinary sound waves by alternately squeezing and stretching the ground in patterns known as compressions and rarefactions. Waves like this are called longitudinal waves and travel at incredible speeds of around 25,000 km/h (15,500 mph). There's another kind of seismic wave known as a secondary wave (s-wave) that travels only half as fast. Unlike p-waves, s-waves travel by making the ground vibrate up and down as they move forward. It's because seismic waves travel at such amazing speeds—broadly speaking, as fast as a rocket taking off—that we get so little time to avoid quakes. Earth's diameter is a little under 13,000 km (8,000 miles) at the equator, so a really fast p-wave can theoretically shoot from one side of the planet to the other in less than half an hour! Artwork: As s-waves travel forward, they shake the Earth up and down or from side to side (at right angles to the direction of motion). P-waves shake the Earth back and forth in the same direction in which they're moving. 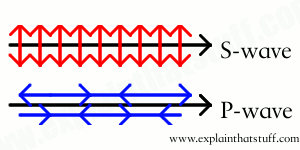 An s-wave is an example of a transverse wave; a p-wave is an example of a longitudinal or compression wave. 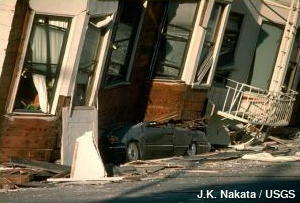 Photo: Housing damage caused by the 1989 Loma Prieta earthquake in San Francisco, California. Photo by J.K. Nakata courtesy of US Geological Survey. Earthquakes are happening all the time. According to the US Geological Survey (USGS), there are several million earthquakes each year (you can find detailed facts and figures on the USGS Statistics page). We don't notice most of them, because many are really tiny and others release their energy in the middle of the oceans. That's not to say that earthquakes aren't a huge problem. Look at the USGS statistics and you'll see that, most years, around 20,000–30,000 people are killed in earthquake disasters around the world. Photo: The 1,200-km (800-mile) San Andreas fault is one of the longest in the United States. It's some 15km (9.3 miles) deep and 20 million years old. 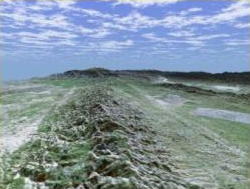 A major quake in the fault in 1857 (known as the Fort Tejon earthquake) was equivalent to magnitude 8.0 on the Richter scale and caused this striking, 350-km (220-mile) surface rupture in the Carrizo Plain. Photo by courtesy of NASA Jet Propulsion Laboratory (NASA-JPL). Earthquakes don't always happen to someone else. You might be surprised to learn that there are several thousand earthquakes each year in the United States. Californians are well aware that they are long overdue for a major strike from a huge earthquake, because their part of the United States is directly above a major plate boundary known as the San Andreas fault. It's important to be able to distinguish between minor earthquakes that cause no damage or fatalities and major earthquakes that result in horrific loss of life. That's why we usually describe earthquakes by giving them a number called magnitude, where a bigger magnitude means a more powerful quake. There are various different ways of calculating magnitude; two of the best known are the the Richter scale (one of the oldest) and the Moment Magnitude Scale (one of the newest). You might also come across the Mercalli intensity scale, which doesn't describe the magnitude of earthquakes but compares their effects on the world around us. The Richter scale is a scientific way of measuring the strength of earthquakes that was developed in 1935 by US geologist Charles F. Richter. A minor quake that rates less than 2.0 on the Richter scale is known as a micro earthquake and isn't generally strong enough to worry people. A major quake will reach something like 8.0 on the Richter scale and is likely to cause widespread damage and casualties. You figure out the magnitude of an earthquake on the Richter scale by measuring the logarithm of how much the ground moves (in other words, the logarithm of the amplitude of the seismic waves). Because the scale is logarithmic, every increase of one whole point on the scale means another 10-fold increase in ground movement. In other words, an earthquake that measures 8.0 on the Richter scale involves 10 times more movement than an earthquake that measures 7.0—and 100 times more movement than a quake that measures 6. The Richter scale has now largely been replaced by the MMS (Moment Magnitude Scale), though you still often hear the Richter spoken about in popular science and the news. Earthquake values on the MMS scale are broadly similar to values on the Richter (for bigger quakes, anyway). The Richter scale is logarithmic, not linear. The further up the scale you go, the more significant every new step up the scale becomes. You can see what this means in practice by looking at a graph of how the amplitude (height) of the seismic waves in an earthquake increases as you go up the Richter scale. That's the curved, climbing gray line. Suppose you start with an earthquake of magnitude 2.0. If the next earthquake you feel is magnitude 3.0, the shock waves have increased in height by an amount shown by the little blue arrow. But if you start with an earthquake of magnitude 7.0 and then increase to magnitude 8.0, the amplitude has increased by a great deal more (shown by the brown arrow) even though you've only gone up one more step on the scale. So when you hear people talking about earthquakes that measure 8.0 on the Richter scale, they're not four times worse than earthquakes that measure 2.0: the waves they create are ten to the power six or one million times greater in amplitude! Although the Richter scale is the most common way of comparing earthquakes, you might also see quakes described using the older Mercalli scale. While the Richter scale has no upper limit, the Mercalli has a fixed range from I ("Instrumental"—barely even noticed) to XII ("Catastrophic"—with almost total destruction). 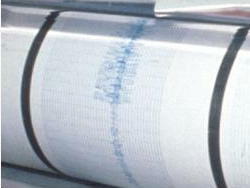 The Richter scale is based on a scientific measurement of an earthquake's amplitude, while the Mercalli scale is more of a description based on the apparent damage that an earthquake causes. That makes the Mercalli more like the Beaufort scale of wind measurement. 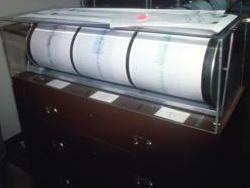 Photo: A seismometer drawing three charts (one of them shown in closeup) of the Loma Prieta earthquake in San Francisco, California as it happened on October 17, 1989. Photo by courtesy of US Geological Survey Photo Library. We can't stop earthquakes and we can't prevent their energy from traveling through the Earth. So how can we protect buildings and people in areas where earthquakes are common? Although it's impossible to secure a building completely, it is possible to reduce the chances of earthquake damage by designing the structure in such a way that it can absorb and dissipate the energy from seismic waves. One way to do this is to separate the building from its foundation using what are known as base isolators. In effect, instead of making the building a rigid extension of the foundations, you stand the upper part of the building on lots of very sturdy rubber feet so it can move about more freely. The University of Southern California (USC) University Hospital in Los Angeles is an eight-story building supported by 149 of these isolators. When a 6.7 magnitude earthquake struck the building in 1994, scientists found that the isolators helped to reduce shaking of the building by about two thirds, and stopped it from collapsing. 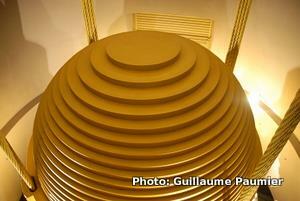 Photo: The mass damper in the Taipei 101 skyscraper in Taiwan. Photo © Guillaume Paumier by courtesy of Wikimedia Commons published under a Creative Commons Attribution ShareAlike 3.0 licence. See more of Guillaume's photos on Flickr. Other buildings are mounted on giant hydraulic devices called dampers, a bit like car shock absorbers, that soak up the ground's shaking motion before it can be transmitted to the upper floors. Some dampers work like gas springs; others rock back and forth like pendulums in clocks; the most complex ones are like pendulums mounted on top of one or two other pendulums to provide huge amounts of shock-absorbing. Possibly the world's most famous building shock absorber is a giant, 660-tonne ball inside the Taipei 101 skyscraper in Taiwan. If an earthquake (or high wind) makes the tower sway in one direction, the ball (mounted on hydraulic rams) moves the other way, effectively canceling out the movement. Animation: How the Taipei 101 mass damper works: The hydraulic rams (red and gray) that support the damper (yellow ball) help to slow the skyscraper's sway in a similar way to the dampers (shock absorbers) in a car's suspension. If the wind or an earthquake wobbles the building one way, the damper tries to stay where it is, dragging on the hydraulics and effectively pulling the building back again. Note that the sway of the building is greatly exaggerated in this artwork. We don't always have to take such elaborate steps to protect ourselves against the power of earthquakes: sometimes very simple precautions are equally effective. If you live in a small apartment in California, you probably don't have the means to install a huge mass damper in your home. But you could still prepare your family for what to do in the event of an earthquake. Photo: Are you prepared? Earthquakes can destroy everything you own in a matter of seconds. 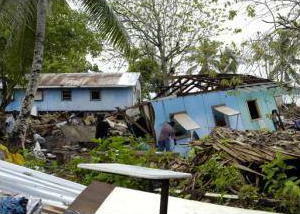 This quake, which measured 8.1 in magnitude, happened at Gizo in the Solomon Islands in 2007. Photo by Andrew Meyers courtesy of US Navy. You could make sure at least one person is trained in basic first aid and ensure that a first-aid kit is easily accessible in your home. You could check that any tall pieces of furniture (such as bookcases or dressers) are screwed securely to the wall so they won't fall on people in a quake. How about putting safety fittings on gas appliances and ensuring that everyone knows how to turn off the gas, electricity, and water in an emergency? You could also swap any ordinary windows for toughened or laminated glass (a bit like bulletproof glass) to reduce the risk of people being cut by huge falling shards if windows break. Simple precautions like these can help to reduce the risk of people losing their lives or being injured both by earthquakes themselves or the fires and other problems that inevitably follow them. If you live in an earthquake zone, why not spend a few minutes now considering how well prepared you are? BBC News: Animated guide: Earthquakes has a very clear animation showing you how earthquakes are formed and travel through Earth. US Geological Survey Earthquakes website includes superb live maps showing exactly where earthquakes are currently happening! Earthquakes for Kids, from the USGS, includes pictures of quakes, activities, ideas for science fair projects, puzzles, games, and loads more great stuff. It even tells you how to build your own seismometer! Predicting the Unpredictable: The Tumultuous Science of Earthquake Prediction by Susan Elizabeth Hough. Princeton University Press, 2010. A very readable, popular-science account of the scientists who try to predict when and where quakes will happen next. Hough is, herself, a scientist at the USGS and well-qualified to write the book. Richter's Scale: Measure of an Earthquake, Measure of a Man by Susan Elizabeth Hough. Princeton University Press, 2007. An accessible biography of Charles Richter and the world-changing, earthquake-measuring scale he created. Earthquake Seismology by Hiroo Kanamori. Elsevier, 2009. A detailed, comprehensive guide to the physics of earthquakes. Earthquakes by Bruce A. Bolt. W.H. Freeman, 2005. A classic introduction suitable for older teenagers, college students, and adults. Forces of Nature: Earthquakes by S.L. Hamilton. ABDO, 2012. A 32-page introduction covering the basic science of earthquakes and the Richter scale, followed by accounts of famous quakes from 1960–2011. Suitable for ages 8–10. Earthquakes by Sally Walker. Lerner, 2007. A good introduction for young readers living (or having family members) in earthquake zones. Explains the geological processes inside Earth that lead to quakes, what quakes are like when they happen, and how they impact people's lives. Suitable for ages 6–8. Turning the Optical Fiber Network into a Giant Earthquake Sensor by Tekla S. Perry. IEEE Spectrum, October 19, 2017. Shifting ground alters how signals travel through optical fibers, potentially offering a reliable way to detect earthquakes. Are Earthquakes in Japan and Ecuador Related? The Science Says No by Henry Fountain. The New York Times, April 17, 2016. Earthquakes happening at the same time in different parts of the world may be completely unconnected. Cheap Earthquake Warning Systems by Prachi Patel and Tekla S. Perry. IEEE Spectrum, May 20, 2015. What's stopping us building low-cost, portable earthquake alarms? Earthquakes: Patterns and Predictions by Erik Klemetti, Wired, May 30, 2013. Humans try to see patterns where none exist, which makes earthquake prediction even harder than it might otherwise be. 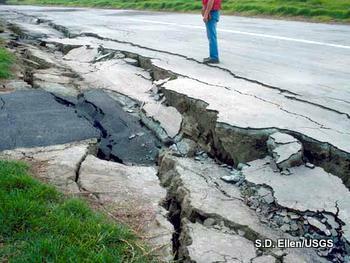 Earthquakes' Many Mysteries Stymie Efforts to Predict Them by Kenneth Chang, The New York Times, April 13, 2009. Why is it so hard for earth scientists to figure out when earthquakes will strike?